In an ever-shrinking world of instant gratification in which going fast is good, then going faster must be even better. Honeywell didn’t come right out and say it, but the company’s 2012 market forecast introduced a new category devoted to the concept of farther and faster. The forecast calls it the “very high speed/ultra-long range” category and notes the first use of that category in 2010 with the Gulfstream G650. B/E Aerospace will open a new 38,000-sq-ft ecosystems assembly facilityWhen Gulfstream launched its G650, the airplane was advertised as the industry’s fastest, displacing Cessna’s Citation X. Now the two are locked in a heat, with manufacturers now highlighting range. The G650 was originally projected to have a range of 5,000 nautical miles at Mach 0.90, but here at NBAA’12 Gulfstream announced the airplane has exceeded expectations and will now fly 6,000 nautical miles at that speed. While there has been talk about which airplane will be the fastest business jet–Cessna’s revamped Citation X or Gulfstream’s G650, both with an mmo in the 0.93 range–the discussion is now moot from Gulfstream’s perspective. The company notes that while the Citation X is a pretty fast machine with a high-speed cruise of about Mach 0.90, the G650 will fly three times farther at the same speed, with more passengers, in a larger cabin. Enter a new competitor for the faster and further crown. At NBAA 2010, with the G650 certification program well under way, Bombardier revealed it would build two new members of the Global series–the Global 7000 and the Global 8000. They will be big. The larger Global 7000 cabin will be 59.6 feet long by 6.92 feet wide and providing 6.25 feet of headroom. By contrast, the G650 cabin is 46 feet 10 inches long and 8 feet 6 inches wide, with 6 feet 5 inches of headroom. The Global 7000 has the edge in cabin volume with 2,637 cubic feet, compared with 2,138 cubic feet in the G650. So as we head for the mid-point of the decade, competition heats up in the VHS/ULR category with closely matched rivals. Some sources were speculating that Gulfstream would announce a stretched G650 (dubbed the G750) here at NBAA’12 to address the Global 7000, but that had not happened as this issue went to press yesterday. 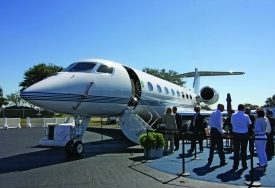 The competition is likely to be lively, recalling those heady days in the mid-1990s when Bombardier and Gulfstream went head to head with the Global Express and GV, running full-page ads in The Wall Street Journal, each not only promoting its own product but also taking any opportunity to point out perceived flaws in its competitor’s aircraft. Is there a market? Honeywell thinks so. Its forecast estimates that market segment will be the fastest-growing in business aviation in the coming decade, based on its survey of operator purchase plans. The Gulfstream order book is a pretty good indicator: the greater part of the company’s hefty $16 billion backlog relates to orders for the G650.